Current technological deficiencies and restrictions on data sharing limit teachers’ access to student data, leaving them inadequately prepared to build off individual students’ strengths and nurture their weaknesses. 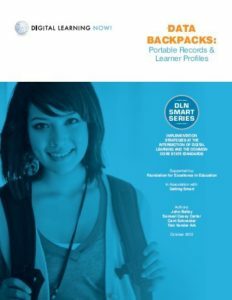 So argues this paper—the second in a useful series from Digital Learning Now!—which introduces the notion of “backpack data”: detailed, personalized digital records that follow a child between multiple districts, service providers, and even states. The ace team of John Bailey, Samuel Casey Carter, Carri Schneider, and Tom Vander Ark recommend a two-part expansion of student data: The Data Backpack would act as one common official transcript, tracking many more indicators (like prior years’ test scores, attendance, and behavior reports) than current transcripts. The Learning Profile, a customizable data tracker for more qualitative points like students’ goals and teachers’ comments, would supplement. Bold ideas but, as the authors admit, not yet actionable: Technical, legal, and definitional challenges remain (though this paper helps resolve the last issue). Before Data Backpacks and Learning Profiles can be used, policymakers must determine how the data will be stored, who the official steward of the data is, and what the actual collection and system will look like. Assurances of privacy will also need to be established. While this paper does not provide the fertilizer, hoe, or irrigation, it does plant the seed for a more robust data-education system. Stay informed. Subscribe to our newsletters and get all the latest news! To find out how our team can work with you, get in touch.